We are pleased to announce our Lake Martin Voice App! The Lake Martin Voice App is your mobile guide for Lake Martin, Alabama. 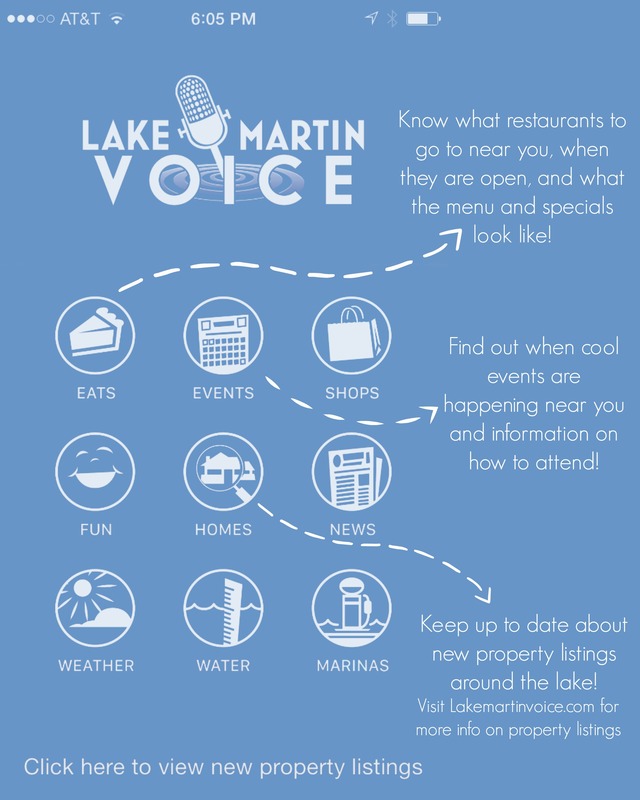 One tap gets you events from around the lake, places to eat, homes and lots for sale, where to shop, marinas around the lake, places to have fun, and more. Homes – every single home & lot for sale in the Lake Martin MLS, at your fingertips. Use our fast searches like “New Listings” or “Price Drops” or create your own custom search. Cruise by boat and see what’s for sale around you if you share your location with the app. Events – what’s going on this week? Next month? Click and scroll to find out. Fun – Other things to do like where to hike, where to bike, boat ramps, golf courses, churches, and more. Weather & Water – conditions right now at Lake Martin. Marinas – mapped locations of all Marinas, plus contact info. Share your location with the app and see where you are, too! Do you have an event you would like us to consider putting on the Events section of our app? Then please CLICK HERE and fill out the EVENTS FORM. Do you have a store you would like us to consider putting on the Shops section of our app? Then please CLICK HERE and fill out the SHOPS FORM. Do you have a restaurant you would like us to consider putting on the Eats section of our app? Then please CLICK HERE and fill out the EATS FORM.